We offer custom backdrops in multiple sizes. These are perfect for large events. Create a full-color banner with your organization's logo and information for an efficient way to get the word out or create a step-and-repeat backdrop for a fun, promotional way to advertise! Great backdrops with high resolution dye sublimation process.. colors won't bleed or fade. 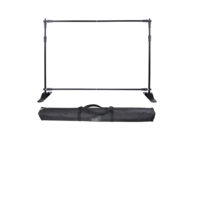 Backdrop stand with carrying case for up to 10' x 10' fabric backdrop! Create a custom Instagram backdrop for your event! Create a custom Facebook backdrop for your event!